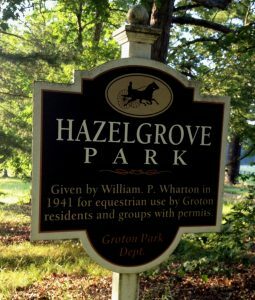 azel Grove Park is a 14 acre Equestrian Park located off Jenkins Road in Groton, MA. Equestrian amenities include: 1/2 mile Standardbred Training Track, Infield Cross Country Course, two enclosed arenas for groundwork, extensive trail riding network and ample parking. The Park is home to both the Groton Riding and Driving Club which was founded in 1932 and the Groton Pony Club which was founded in 1957. Hazel Grove Park is open to the public from dawn to dusk for all wishing to use the trails and infield. To request use of the infield for groups of 5 or more, please email us for more information. HGAA welcomes monetary donations in any amount to help us revitalize Hazel Grove Park. We appreciate your interest and your help. To donate, you can either send a check made out to HGAA and mail to: PO Box 155, Groton MA 01450.